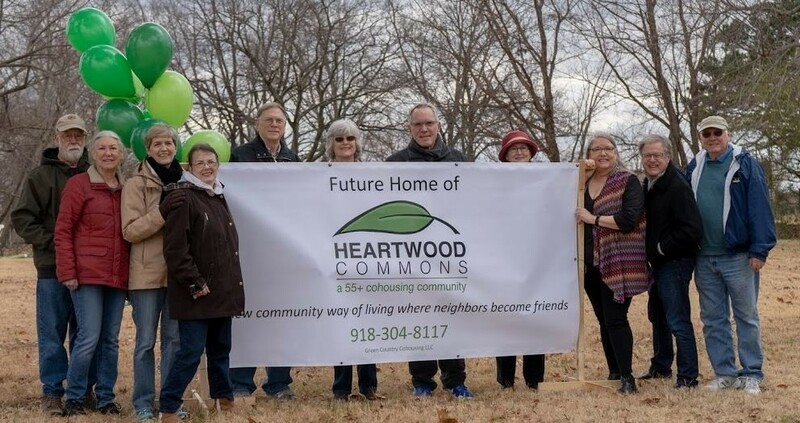 Heartwood Commons is a local group of friendly, engaged and proactive 55+ adults who are working together to create Tulsa, Oklahoma’s first cohousing community – a vibrant neighborhood where neighbors know and care about one another. We are a welcoming community whose members acknowledge and celebrate our connection to one another and nature in a caring, compassionate, respectful, and sustainable environment. We value acceptance and diversity, health and wellness, fun and support. Some of us are single, some married, some working, some retired. We have no common political or religious orientation, only a shared desire to live in a neighborhood that fosters an active and supportive community life. We have land and have begun the design phase assisted by local architect, Molly Jones, Jones Design Studio, who specializes in sustainable design and Brian Bowen, Caddis, of Boulder, Colorado, who has designed 15 cohousing communities and lived in cohousing for 14 years. Katie McCamant of Cohousing Solutions is our development consultant. We are planning 32, cottage style private homes with large front porches. These energy efficient one, two, and three bedroom homes will be accessible and range in size from approximately 700 sf to 1500 sf. Our common house will be filled with light, laughter, good food and fun times. It will include an open floor plan with a large dining area/activity room, fully equipped kitchen, a grand piano, and living room/library and media room. Also included are guest rooms for family and friends, art/craft studio, laundry, patio and large screened porch. Other onsite amenities include community gardens and greenhouse, woodshop and tool library, weather safe room(s), yoga/meditation pavilion, hot tub, bike storage shed, and garages and covered parking. Shared outdoor spaces include convenient gathering spots, open green areas, fire pit, dog park, Monarch way station, and walking paths. Fully equipped exercise facilities and classes are close by. Tulsa is located in the northeast corner of Oklahoma, in the heart of “Green Country” where we enjoy 4 distinct seasons, great gardening and outdoor entertainment time. We are located on 4.8 acres situated less than a block from the Arkansas River walking/biking trails and close to many amenities such as Gathering Place (recently named USA Today’s most popular attraction), Turkey Mountain Wildlife Preserve, Jenks Aquarium, the downtown Art Deco district, and a revitalized section of Historic Route 66. Tulsa is home to exceptional ballet, opera, symphony, and performing arts groups, museums, colleges and sports teams. The home of Western Swing, Tulsa has emerged as a top-notch music scene that includes the Woody Guthrie Center (also home to the Bob Dylan archives), BOK Event Center, and the soon-to-be OK Pops Museum. Shopping is diverse in Tulsa from weekly Farmer’s Markets to our nearby Tulsa Hills Shopping Center, historic Utica Square, and the Brookside and Cherry Street neighborhood shopping districts. Join now to secure a home in Heartwood Commons. For more information, visit www.heartwoodcommonstulsa.com, follow us on Facebook @HeartwoodCommonsTulsa or contact us at 918-304-8117 or greencountrycohousing [at] gmail [dot] com.